Appetizers to wet your whistle or set the stage for a delicious entree. Try our Kokomo Shrimp, Nachos Grande, Cajun Queso dip or our Wild Island Wings with 8 diferent sauces and dry rubs to choose from! Our fish tacos have been voted best in Fort Collins! Try our Bahama Mama or Ahi Tuna tacos, or go traditional with beef, chicken or steak. Choose bewtween our Pico De Gallo or our Mango Salsa to top-ff your tacos. It's always taco time at the Grill! Enjoy our Big Kahuna burger or build your own juicy burger. Go with the Hang Ten burger or our the Volcano burger topped with buffalo sauce! You can also try the Tasty Wave burger or the Surfer Dude burger toped with cream cheese & jalapenos. Enjoy our Turkey Avocado Club, the Philly Cheesesteak, or our Tsunami sandwich topped with pineapple & lime cilantro coleslaw! We also have wraps like the Buffalo Chicken wrap and the Garden Chicken wrap. Give one of our specialty dishes a try like the Island Fajitas, our huge Chile Rellenos Camarones or the Enchiladas Del Mar. 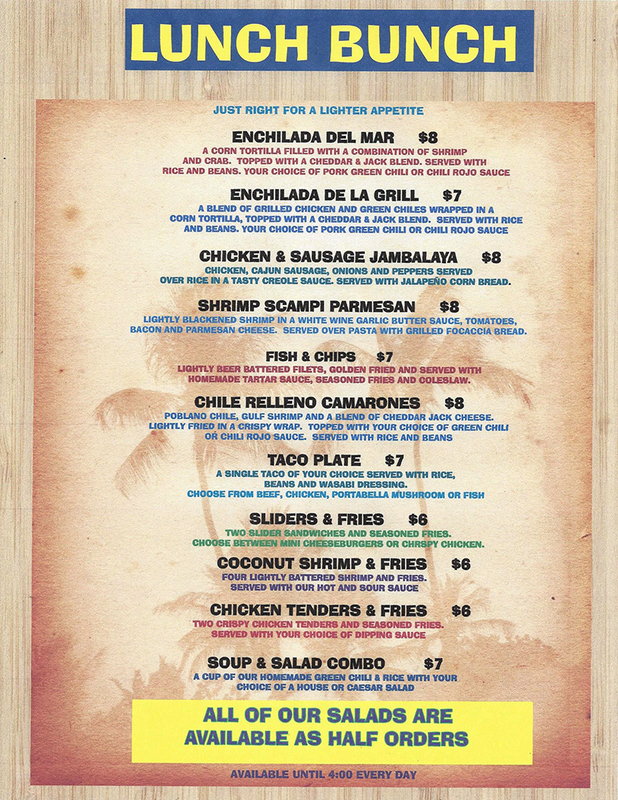 We would love to make you one of our favorites like the Fish and Chips, Jambalaya or the Island Stir Fry. Enjoy one of our signature salads like the Sesame Seared Tuna, Singapore Chicken or the Bermuda Blackened salads! If your looking to eat more on the lighter-side try a side salad with our specialty soup the Green Chili and Rice! Finish off with one of our signature desserts! Our desserts are so HUGE you gotta share our Caramel Mango Crisp or Chocolate Chip Brownie sundaes with a friend. The Island Key Lime pie is always worth a try! We have a new lunch menu for you to try! 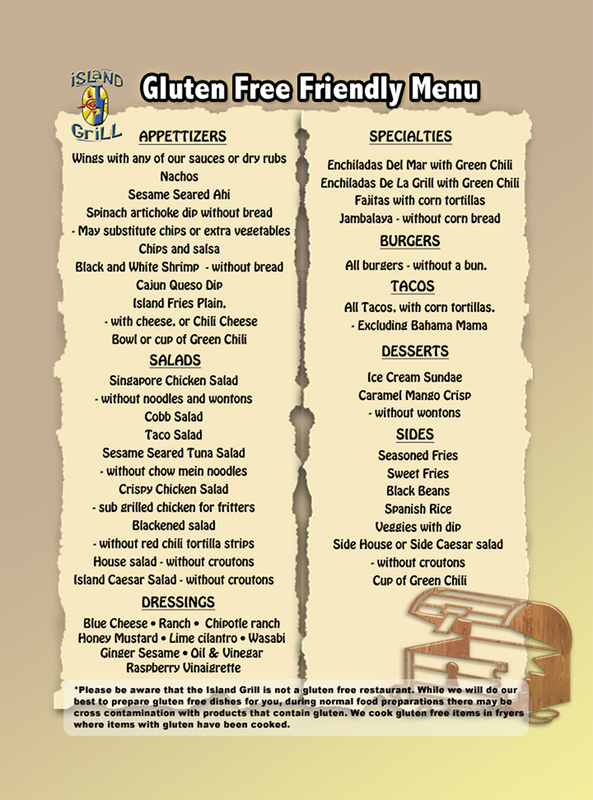 Look over this new menu for all our new lunch items. It just right for a lighter appetite. We now have a gluten free menu for you to try! Look over this new menu for all our gluten free items. Keep in mind, we do cook gluten free items in fryers where other items with gluten have been cooked. We offer many catering options for large or small groups, both in-house or at your location. We are able to accomodate your needs for any party experience. Great for business meetings, holiday parties, or just a good ol' get together.